Barts Big Bang holds off PJ Whattheywant to Win the 2018 $50,000 JWP Derby! ROUND THREE QUALIFYING FOR PALM BEACH KENNEL CLUB’S $50,000 JAMES W. PAUL 3/8THS MILE DERBY WEDNESDAY AFTERNOON, FEBRUARY 13! O YA FIRE FLY AND NEWBURYPORT REMAIN UNDEFEATED! West Palm Beach, Fl. 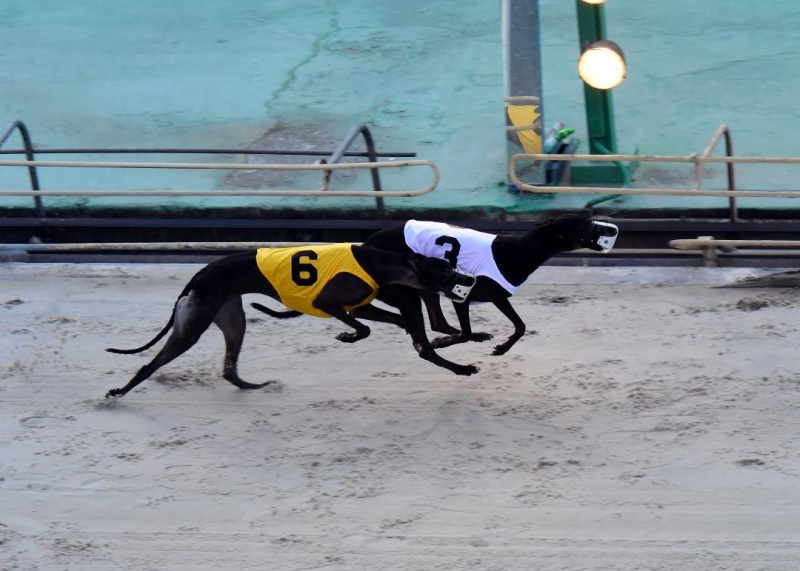 – After an exciting set of second round qualifiers, round-three action for the 88th running of Palm Beach Kennel Club’s $50,000 James W. Paul Three-Eighths Mile Derby takes place Wednesday afternoon, February 13. Four qualifying races will be held, with the top 16-point earners advancing to the semifinals Sunday afternoon, February 17. After two rounds of qualifying, only two entries have a shot of entering the semifinals undefeated, Lester Raines Kennel’s O Ya Fire Fly and Rader Racing Kennel’s Newburyport. In Race 14, #2 O Ya Fire Fly (Kiowa Mon Manny – O Ya Victoria) puts her streak on the line against a very strong field including first-round qualifying winner #1 Stoughton (Djays Octane – Myra Kraft, Rader Racing), second-round victor #3 Bartsblackrushin (Gold Town* - Barts Magpie, James Douglas Kennel) and perhaps Fire Fly’s biggest threat, first-round winner, #8 Elizabeth Banks (Pat C Clement – WW Lonesome Dove, D. Q. Williams Kennel). Race 15 features the undefeated entry, #3 Newburyport (Djays Octane – Myra Kraft, Rader Racing). If she can rush to the lead as she did in rounds one and two, then entering the semifinals without a qualifying loss is guaranteed. Also, a good in-the-money potential comes with the well-posted #1 Barts Jasmine (Deerfield Mover* - Barts Lilac, James Douglas). It should be noted that in this event, there is only one other Greyhound who was a qualifying-round winner, Koppe, Staats & Collins Kennel’s young phenom, #7 Pat C Snickers (Pat C Clement – Pat C Deception). Qualifying events will also be held in races ten and twelve. Post time for the first race Wednesday afternoon is 1:00 p.m. The $50,000 James W. Paul 3/8ths Three-Eighths Mile Championship final will be contested Saturday afternoon, February 23, and is one of the nation’s longest-running stake events. The Derby is named in honor of humanitarian, greyhound owner and dedicated supporter of greyhound adoption James W. Paul.